While the Palestinians were participating in the peaceful protests outside the occupied borders, “Israeli” occupation forces martyred at least 9 of them, including a journalist, and wounded more than 1,000 others. In further details, thousands participated in a mass demonstration demanding the right of return for Palestinian refugees. While the Palestinian Health Ministry reported on Friday that 293 people were injured by live ammunition after Israeli forces fired on protesters who had gathered near the Israeli border in the besieged Gaza Strip.Elsewhere, hundreds of protesters suffered other injuries, including tear gas inhalation.Relatively, one of the martyrs was journalist Yasser Murtaja, a photographer with the Gaza-based Ain Media agency who was hit during protests Friday. Later, an AFP photograph taken after he was wounded showed Murtaja wearing a press vest as he received treatment.Meanwhile, the “Israeli” army declined to comment, claiming it was reviewing the incident. 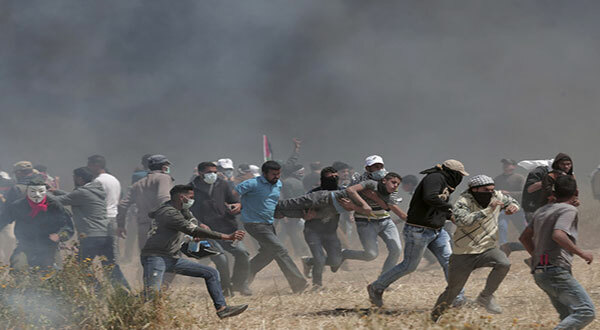 The deaths brought the number of Palestinians martyred during Friday’s confrontations to nine after thousands gathered along the border for the second week in a row. Some Palestinians burned mounds of tires and threw stones at “Israeli” soldiers over the border fence. In all, at least 491 Palestinians were injured by shooting, the health ministry said.